A few comments on the game yesterday. 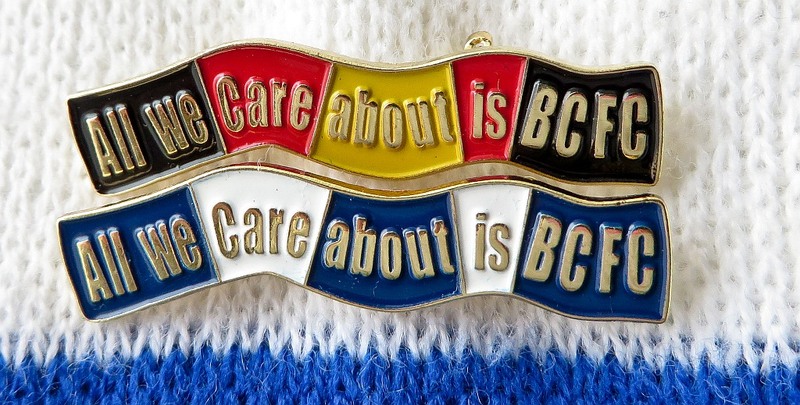 There were some new ‘All we care about’ badges on sale outside the ground. I think it’s a good idea to have two versions: one with the German flag colours and one in blue and white. I’m always glad to see someone creatively adapting an idea; I’m especially glad to see someone else is doing it so it doesn’t involve any work for me. I’m a bit too busy to take on any more projects at present. Wonga is all wrong on a football shirt. I didn’t enjoy seeing it on Blackpool’s shirts but was glad it wasn’t on ours. I don’t much care for Nicolites as a shirt sponsor but Wonga is worse. The effort, attempts on goal and saves made it an entertaining game. At times some football broke out and passes connected well. At other times they just seemed to be heading or kicking it anywhere and I could hear the pain in the voice of the man sitting next to me who was yelling detailed instructions to our players. I thought that both debutants, Darius Dudka and Aaron McLean, looked like useful signings when they came on as substitutes. I was pleased to see Dan Burn put in a decent performance and make a good save off the line; that should help his confidence. I was also glad to see Mitch Hancox play well in the No. 18 shirt; the previous holder of that squad number, Keith Fahey, was a favourite of mine. The point was also welcome though I feel a little detached about our position in the league. It’s probably because events off the field seem more important and it seems inevitable that we’ll go down if the club goes into administration. Predicting what will actually happen is as difficult as predicting the results of our games. On Saturday evening I watched another convoluted drama end with all the Dr Who’s facing a hopeful future; let’s hope the Blues ownership saga also has a happy ending. This entry was posted in Birmingham City FC, Football and tagged AWCA, Birmingham City F.C., Football on November 25, 2013 by Puddleglum.